50 Comments Published by Cedric Benetti on Thursday, December 4, 2008 at 12/04/2008 10:20:00 PM. I'm not trying to push you towards extreme Xmas consumerism, I'm just the guy saying "Oh look, a bunch of colorful stuff with lights! How neat!" Having said that, go shop! GO! SHOP! Your economy needs you! "Oh look, a bunch of colorful stuff with lights! How neat!" Cute LaFayette pictures. They raise nice memories of last year. And thoughts about consumerism, and waste of electricity... lovely. My first time stopping by your journal. These pictures are so beautiful! The ornaments so big and colorful. That tree is adorned beautifully. It reminds me of something we'd only see while dreaming. Thank you for sharing the beautiful pictures with us. What amazing photographs. You now how to bring out the beauty around you. Thank you. Great pictures! I can't wait to go to France! I love your blog and I think I may love you too. It is a nice thing to come across your blog. Wow ... I'm always in for beautiful pictures. Congrats on blog of note. Awesome Site! You reached me, Mr., from the U.S. You make me realize that there is so much to see. oh so beautiful. wish I were there. Nice Photos. 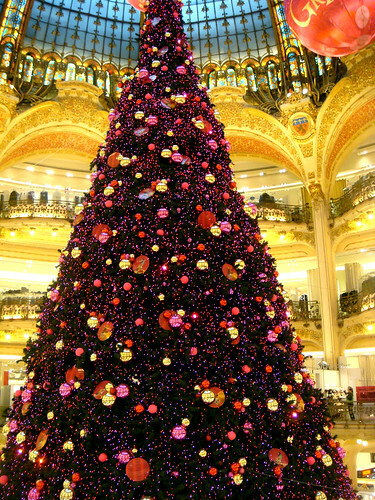 I am getting Ideas for this Christmas..
Galeries Lafayette is already so over the top beautiful and then they go and do Christmas. I fear my Christmas will not be so grand as to be a Lafayette one. But I appreciate the wish and also your beautiful photographs. Merci! Cedric, perused your blog this a.m.
Found it has a certain visual "push" to it that walks a line for dramatic. Which is good. Wondering if the building dialogues are tied to personality. 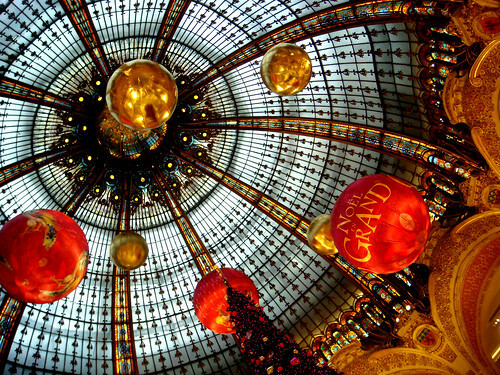 nice blog :) been to Paris but can't imagine what it must be like living there, you're lucky. I just have to say i share your obsession with exclamation marks :) and apparently smiley faces, but, yeah!! Maybe i'll stop by here again sometime. Those christmas decorations seem like they are from another planet. Les Francais - they know how to do it. Counting the days til I'm in Paris. Those after-Christmas sales will be calling my name! I just came across your blog today. I'd love to follow it, but I can't find the option. 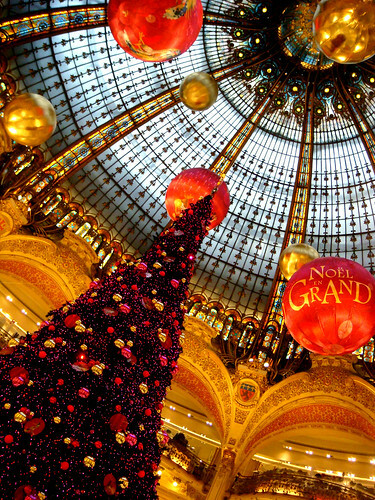 great pictures i love christmas, especially in paris (the decorations) so much neater and more pleasant to look at than the rubbish you see here in England! just came across your blog today looking forward to more posts! Felicitation! Vous avez capture Paris comme je m'en souviens! I just found your website. You have posted some very interesting information. Thanks! Very cool! I love you. Welcome to China,Your personal trip advisor for China tour. Save up to 60%. Visit now! Wow! Maybe I'll go there one day. is there a theme to your pics or just the neurotic obsessions of a deranged queen? Yes the theme is "I'm waiting for the first idiot to post something insulting on me" and you just won the first prize! Do Parisians or Parisiennes ever obey the traffic signals either when walking or driving :-) ? en gros : oh lala..
ADORE these pictures ... Absolutely beautiful. What a glorious tree.